I am really lacking with posting here. It's been a busy spring. Soccer is taking up a lot of time. Only 2 games left, woo hoo! The kids are having fun. With breaks in it for mountain biking and spring break. The kids raced in a kids mountain bike race a couple of weeks ago and did awesome! Their Daddy even cleaned up with a third place finish in his age group. Those over 40 guys are competitive and there are tons of them in that age group, so I'm so proud of my guy for pedaling out there! This past weekend we did a half-century ride with the kids on the back of our tandems. (That's 50 miles of biking!). The kids did amazing! Thankfully the weather was wonderful, which helped our spirits. The kids never complained once and enjoyed the food stops. That ate so much food! We didn't see many kids out, so ours were getting lovely compliments all day. They are great little bikers. And I have no idea how they still had energy to jump on the trampoline when we got home! Perhaps they should have pedaled a little harder. 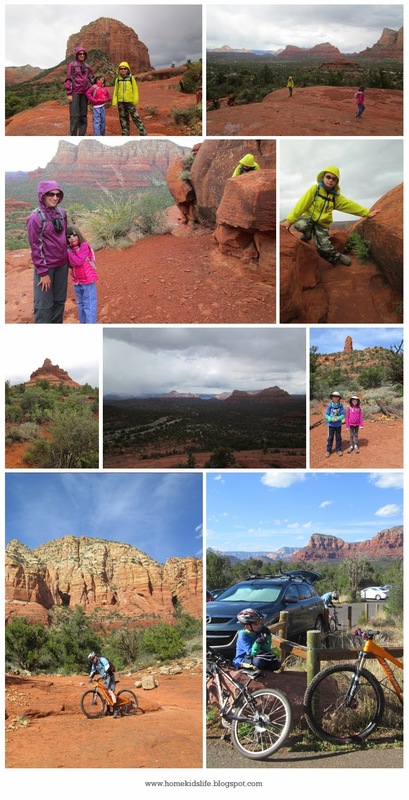 We took a spring break to Sedona, Arizona. It was a fun time. I won't recap it all. It snowed on us while we were there, at the end of April!! 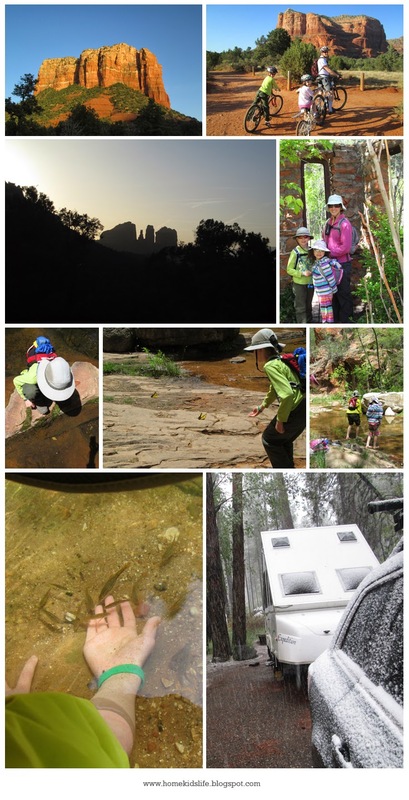 We stayed in the Oak Creek Canyon at Cave Springs Campground. It was okay. Not our ideal campground, but it was there. We did a lot of mountain biking and hiking. 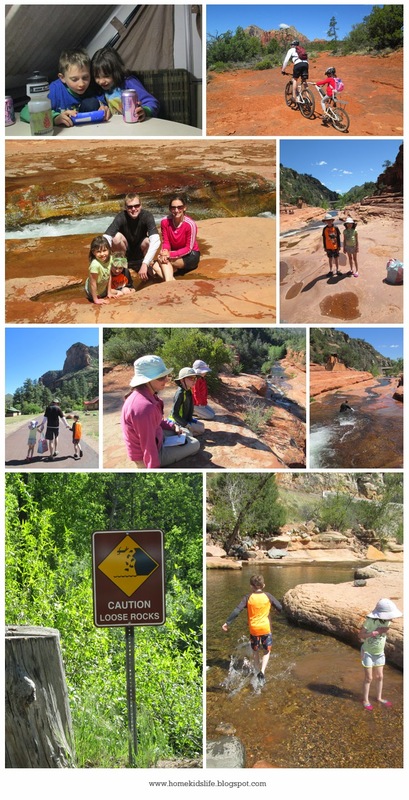 We even went to Slide Rock State Park. It was 60 degrees, but sunny. It was a Monday and there weren't too many people there. We went down the slide rocks in the freezing cold water. Scooter and I went down twice. Biker Boy went 2 and a half times, he took Chewy down half of it. I can see how that place would get busy on a hot summer day. Overall, it was a lovely time with the family and wonderful memories were made. Four more days of school for us! We're looking forward to the summer! I can't believe how fast this school year went by. We'll be homeschooling again next year, I think it's a really good fit for us right now. Ohhh, they were filming a movie in our neighborhood the past 2 days. Didn't see much, except for a lot of vehicles. Apparently there's a big name movie star in it. And in other news, we are now the owners of a decent sized tractor. Some trees have been cut down and now the dirt moving can commence, once a hose gets fixed on the tractor. Here's hoping we can clean up our driveway area!